Girl Scout Cookie season is soon arriving and I cannot wait. I should probably be a little scared its arriving so quickly because I have absolutely no self control when a box of Samoa Cookies is presented in front of my face. I love easy, crowd-pleasing, delectable, unique dips. With Valentines Day coming, I am thinking about the sweet stuff. 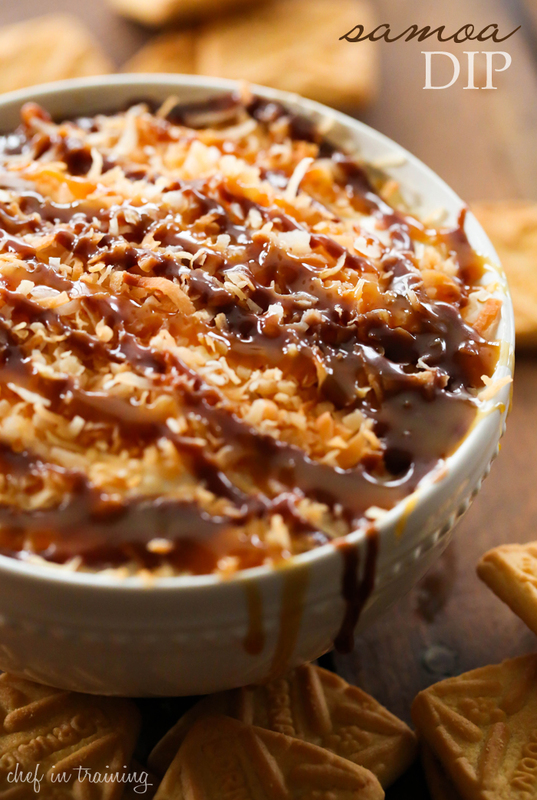 This Samoa Dip is sweet and addicting. Creamy caramel base, topped with toasted coconut and drizzled with additional caramel and chocolate- I could faint of sheer happiness. Dip some Shortbread Cookies (like Lorna Doones) into it and you are in a Samoa Cookie inspired heaven. Everything I love enveloped in on amazing recipe, and it whips up in no It is as beautiful as it is delicious. In a large bowl, combine cream cheese, cool whip, powdered sugar and caramel sauce and beat until smooth. Pour into a serving bowl, making sure there is enough space between dip and rim of bowl to save room for toppings. Top with toasted coconut then drizzle with chocolate sauce and caramel sauce. Serve with shortbread cookies, graham crackers or vanilla wafers. Can't believe Girl Scout season is rolling around already...although I'm not complaining! Samoa's are my absolute fave, pinned this recipe! Keebler makes a cookie that's like Samoas, for those times when you just can't wait for Girl Scout Season! I'm so glad I discovered you on facebook; you have some of the best recipes! Thank you so much for sharing! !